CARBONDALE — The third performance in The Varsity Center’s Classical Guitar Concert Series features Carbondale artist Tim Steis. The series is sponsored by First Southern Bank. The name "classical guitar" refers not to the music being played — which can be any music from Bach to rock 'n' roll and beyond — but to the type of guitar being played. 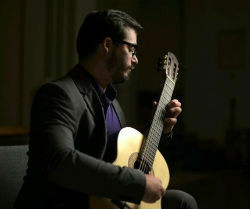 Steis earned degrees in performance classical guitar from Florida State University under the world-renowned teacher and guitarist Bruce Holzman and under Julian Gray at the Shenandoah Conservatory of Music. He was a prize winner at the Troy State Guitar Competition and has been a performer in the Master Classes of Pavel Steidl, Jorge Caballero and others. “Tim Steis plays Debussy, Scarlatti, Rodrigo, Sor and More” is at 7:30 p.m. Saturday, March 23. Tickets are $12 in advance at thevarsitycenter.eventbrite.com or $14 at the door on the night of the performance. Student tickets are $8; children 10 and younger are admitted free. The Varsity is downtown Carbondale at 418 S. Illinois Ave. To keep up with events at the venue, go to facebook.com/varsitycenter.